January 4rd – 10th, 1st and Library Floor. Bangkok Art and Culture Centre. Cre8 Foundation is a worldwide community of artists and collaborators who inspire and unite children around the globe through collaborative art since 2008. 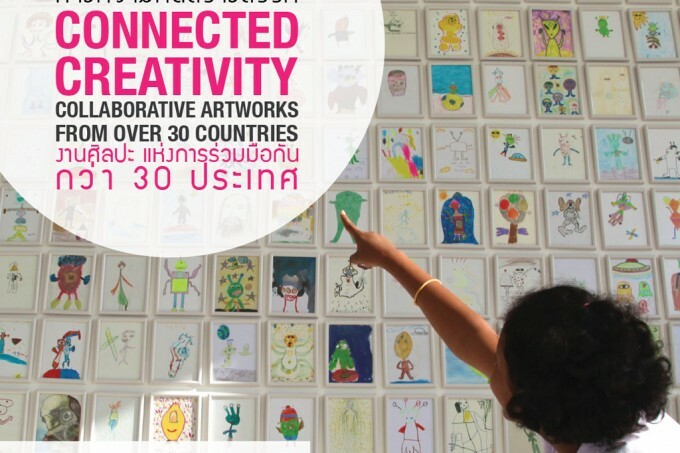 At the beginning of 2012, we started a collaboration with the artist residency Thaillywood in Nongketyai in Chonburi, Thailand, conducting art workshops with children at the local school. It is our great pleasure to present our exhibition that will take place in Bangkok for the first time. CONNECTED CREATIVITY is an exhibition of global creative collaboration showing the outcome of creative workshops that have been done by kids in over 30 countries around the world. This will be held in an exhibition space provided by Bangkok Art and Culture Centre (BACC). Opening Reception Saturday 5 January. With a special event Fundraising Silent Auction, from 10 selected art pieces and all proceeds will go directly back into the organization, allowing us to reach more kids. SEE YOU THERE & LET’S CREATE! พิธีเปิดวันเสาร์ที่ 5 มกราคม 2556 เวลา 17:00 – 20:30 น.